You probably know methyl benzoate when you smell it. The natural compound’s wintergreen-spicy, floral-fruity aromas make it a popular ingredient in perfumes, soaps, and shampoos. Snapdragons and petunias emit methyl benzoate to attract bees for pollination. Many insects also produce it as an attractant. But not all insects like this compound. 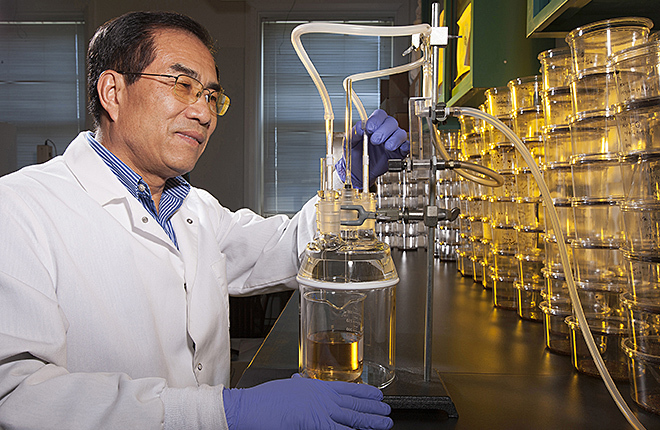 Chemist Aijun Zhang, with the Agricultural Research Service Invasive Insect Biocontrol and Behavior Laboratory in Beltsville, Maryland, has found a new use for methyl benzoate, namely as an environmentally friendly control for agricultural pests like the spotted wing drosophila fly (SWD), an invasive species from Asia. First found in California in 2008, SWD has quickly spread across the United States and can cause significant damage to fruit crops, especially berries. There are currently few choices for controlling SWD. The possibility of a new bio-based pesticide—especially one based on an inexpensive chemical whose residue lasts a relatively short time in the environment—is exciting. Compound No. 19 turned out to be methyl benzoate, a compound approved by the U.S. Food and Drug Administration for use in foods and cosmetics. 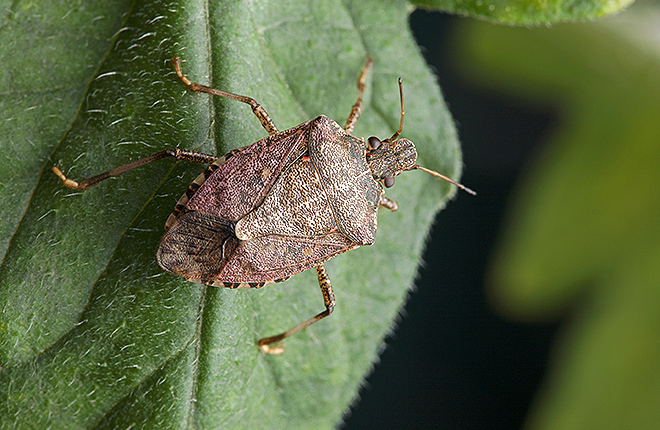 Zhang then tested methyl benzoate against other agricultural pests, including the brown marmorated stink bug (BMSB), diamondback moth, and tobacco hornworm. He found that the compound can kill all stages of these insects—egg, nymph, and adult—though it works better against smaller insects than larger ones. Zhang focused first on SWD and BMSB because they are fast becoming important agricultural and household pests, even though they are relatively new invasive species. New controls for these pests are urgently needed. 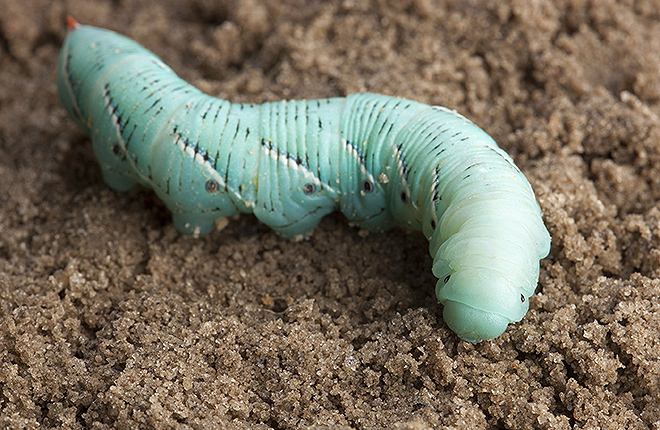 According to Zhang’s tests, methyl benzoate is 5 to 20 times more toxic to eggs of BMSB, diamondback moth, and tobacco hornworm than a conventional pyrethroid insecticide, a sulfur and pyrethrin mixture, and some organic products currently on the market. Next, he is planning to test methyl benzoate’s effectiveness against fire ants, gypsy moths, stored-product insect pests, and mosquitoes. All these insects are developing resistance to standard pesticides. Zhang is also investigating whether low doses of methyl benzoate could control Varroa mites, the number-one problem of managed honey bees today. A patent has been applied for methyl benzoate’s pesticide uses. One company has already expressed interest in it.—By J. Kim Kaplan, ARS Office of Communications. Methyl benzoate is a natural compound used in foods and cosmetics. Methyl benzoate could be an environmentally friendly pesticide.